In the interest of providing you with impartial advice about which coffee maker will be the best one for you and your needs, we’ve been trying out some of the available models. Not only does this give us a clear picture of each machine, it’s also a great excuse to drink lots of extra coffee! We have tried and tested a lot of machines, one of which was the new Bunn BT Velocity Brew. This nifty little machine has a lot of plus points and is packed with great features. Really fast brewing time: This machine brews four to ten cups in around three minutes. Unique spray head: The spray head on this machine is specially designed to ensure that the extraction is even for the best flavour. Stainless steel water tank and 800W heater: The combination of the 800W heater and the stainless steel water tank work together to keep the water at a consistent 200 degrees. This means that even after your coffee is brewed, you can get scalding hot water from the machine if you want to top up your coffee pot or use the machine to make tea or hot chocolate. The Bunn BT Velocity works well once you get the hang of it. It isn’t the easiest machine in the world. You will find that sometimes, the machine does leak a little, but this combatted by using a twelve cup filter paper rather than a ten cup filter paper. The brewing process itself is simple. Add your water – measure it out to the exact amount you want as whatever goes in will come out. Add your coffee. As it is recommended that this machine is left switched on all the time, there’s no start button as such and no timer features. Simply close the lid when you want the brewing process to begin. The machine, on first using it, produces a strong, plastic smell when brewing. Bunn advises that this is normal and should dissipate after around six weeks of use. This machine produces a good, even flavour of coffee and the coffee does stay warm for the stated time. Who Is This Machine Best Suited to? 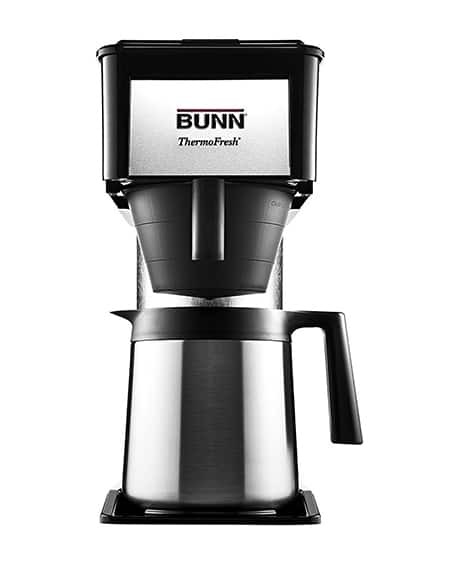 This Bunn machine is best suited to people who have had coffee machines before and understand the quirks that can come with them. This isn’t a simple machine to use, so it’s definitely advised that you are either already familiar with the process or are willing to learn. The machine is ideal for anyone who wants a full pot of coffee fast. The brewing time on this machine is really impressive and the coffee tastes good even after the two hours standing time. Who Isn’t This Machine Suited to? The Bunn BT Velocity isn’t a good starter machine. It is best suited to anyone who knows the ins and outs of coffee making. It isn’t a good fit for anyone who like to be able to set a timer for their machine to start brewing for them to wake up to as the machine had no programmable timer. Overall, this machine is just ok. It does make good tasting coffee, it does make a nice hot cup and it does brew super fast. Having said that, it isn’t as good as previous Bunn models, and the lack of programmable features, the plastic smell and the constant leakage let it down a lot. For the price (it retails at around the $100 mark) it’s a very expensive machine that does very little and there are better options available in this price range and indeed in much cheaper price ranges. If you have your heart set on a Bunn machine and are willing to change the way you brew coffee, then you might get away with this machine.